● You can receive free shipping if your order is over $89. This offer only applies to shipments to locations in the continental US. Free shipping orders typically take 1-3 business days to be delivered. ● Enjoy savings of up to 60% on products featured in the Closeout and Overstock Bin. ● Check out the Super Deal of the Day in order to take advantage of reduced prices of featured items. ● If you shop frequently at Motorcycle Superstore, you may want to sign up with the Rider Rewards program in order to earn points on every purchase. These points are redeemable for items once sufficiently accumulated. ● Sign up for the email newsletter in order to get offers, sales, and information on special events. 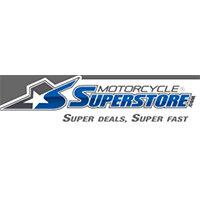 The Motorcycle Superstore is a one-stop shop solution for motorcycle owners, mechanics, and enthusiasts that are looking to get their hands on hard to find or difficult to source parts and accessories. This entire operation is built around making sure that individuals that own motorcycles or work on motorcycles are able to repair them with brand-new (and usually OEM) parts, or that there are able to upgrade their motorcycles with quality accessories and parts that they know they are going to be able to trust. The Motorcycle Superstore is home to hundreds of thousands of parts and accessories that can be searched on their product catalog, but individuals can also contact customer service and inquire about parts they weren't able to find as well. For most up to date offers check out Motorcycle Superstore on Facebook and Twitter or contact Motorcycle Superstore Support for any questions.